I scream, you scream, we all scream for ice cream burgers. No? Just me? Whatever — that just means more of Carl’s Jr. Ice Cream Brrrgers for me! Currently CJ’s (can I call you CJ? I love your work!) is testing the ice cream burger in at least one SoCal location. I’m gonna have to track one of these babies down. You know, for reporting’s sake. 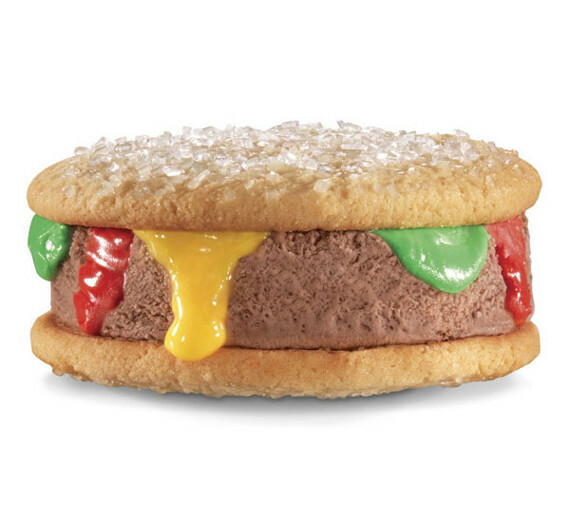 The frozen treat’s made of chocolate ice cream meats, sugar cookie buns, and ketchup and mustard icing. What, no mayo? Nary a pickle? This is an abomination! But you think that’s gonna keep me from eating as many as I can until I get the brain freeze of all brain freezes? You know me all to well. I’ll gladly pay you Tuesday for an ice cream hamburger today. This looks distuburbingly delicious.